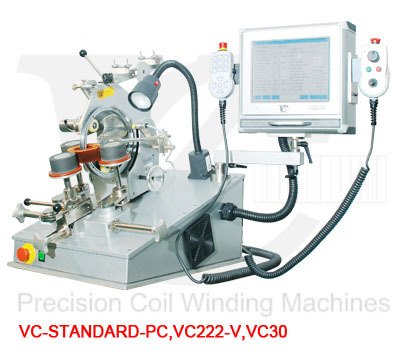 The VC-STANDARD-PC is a Hi-Tech bench machine with PLC control and PC with touch screen and incorporates VC's flexible system with interchangeable heads and roller tables. It is designed with servo motor for head drive and servo motor for core drive. The user friendly software guides the operator thru the programming with clear graphical commands. Typical jobs for the VC-STANDARD-PC are general taping and winding jobs as well as sophisticated applications.